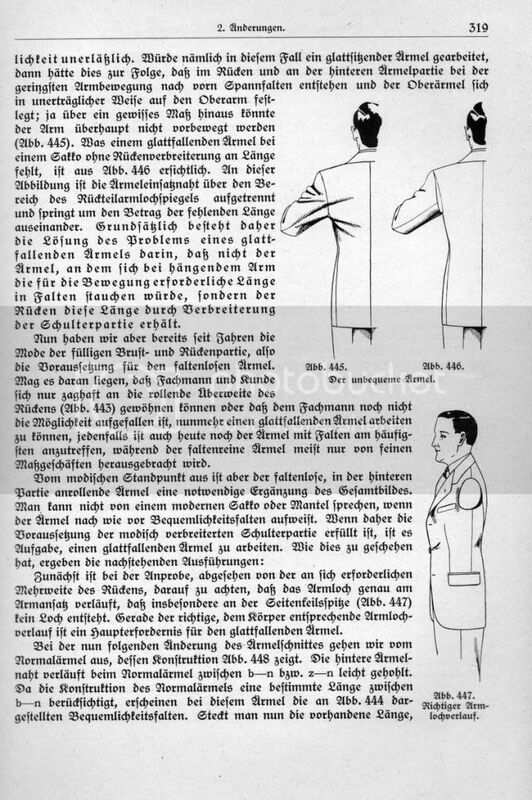 My method to cut sleeves is very similar (I mixed Darroux and Rundschau). Only I set 7 at 3/4 of the sleeve cap height, and 7 from 8 is the same vertical distance as back pitch from bottom of armhole. Every thing else exactly the same. It gives very good results indeed for a small armhole, even if I need more than 1/2 hour to draft, cut and set 2 sleeves. 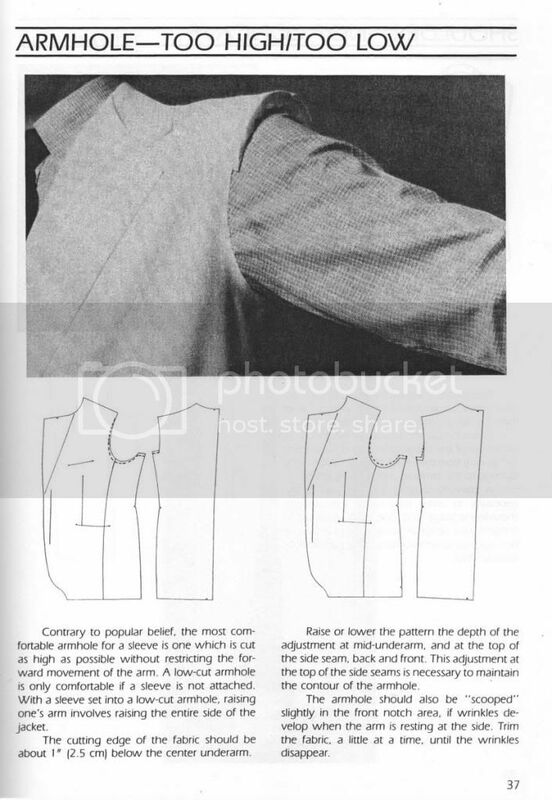 I recently had a lot of problems with an armhole which makes me think of the strange one on the picture. 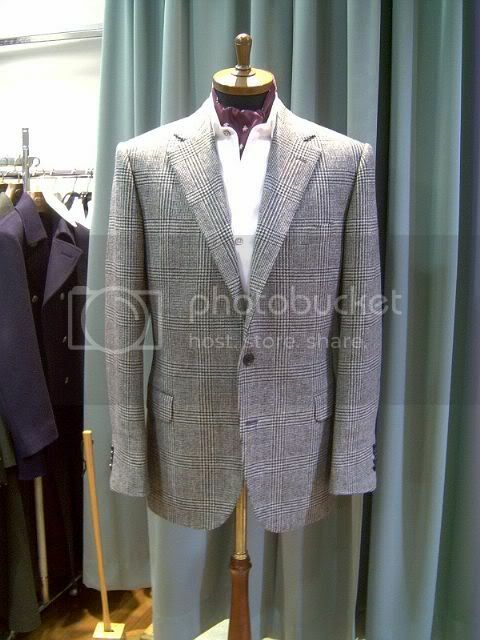 It was because the customer is very small but muscular and with a big chest, so the armhole got strange. To give him freedom of movement, I had to cut a sleeve with a gusset in the underarm. I'll post what I did as soon as I can (I need to finish this suit soon, and still have a lot of work). This is why I love the "ugly fabric bin". The ugliness of the fabric forces you to focus on the construction. I don't know how you manage! Edited by Terri, 26 June 2010 - 11:25 AM. Wow 23" Terri? I'm a tub-O-lard and my arm is nowhere that big. JC, what are designers and RTW houses thinking? or are they not thinking hence the craziness they call armholes. I can't speak for everyone. I haven't cut a 23" scye since 1989. What was the breast size of this coat? Well, we fight, we struggle, we curse. And that on a daily basis. The really weird thing is that they more or less use the same formula like I do, that's why I said it works best with "decent" armholes. 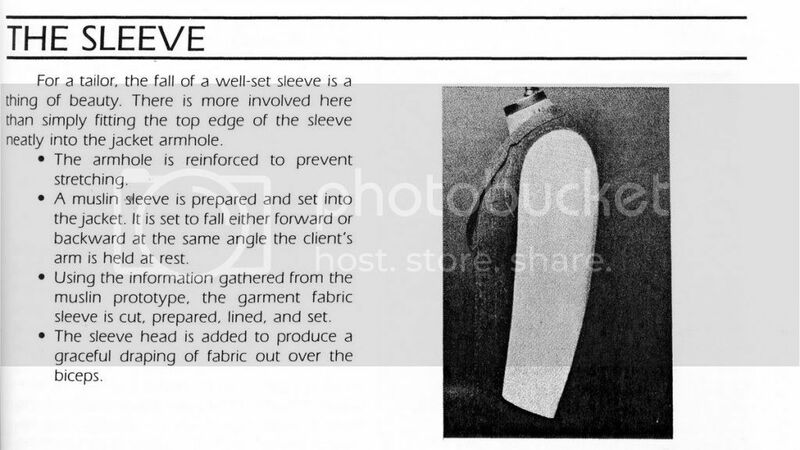 The sleeve itself looks like the blue one I posted: Very narrow upper sleeve with a pointy crown combined with a relatively wide undersleeve. You can clearly see how the fabric's pattern is not horizontal. The maker responsible for this armhole is one of the bigger German RTW companies, so the sleeves are prepared accordingly. A major problem is that they often overdo the shirring at the crown top, which makes things even worse. 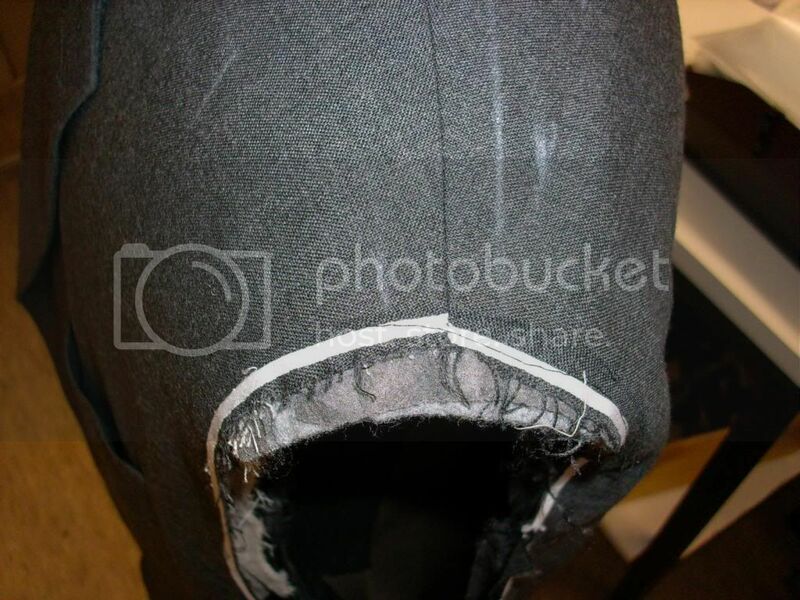 The tape is there to show how ridiculously short the crown is compared to the depth of the armhole. This one was 1" shorter than the final armhole. @jc : The size of this "thing" must have been around 60 (that's 120cm chest girth of the customer). The dummy has a 52. Another basic problem when drafting a coat is the proportionate scye depth. The Rundschau system has a set of formulas based on the chest girth, rather than the body height. 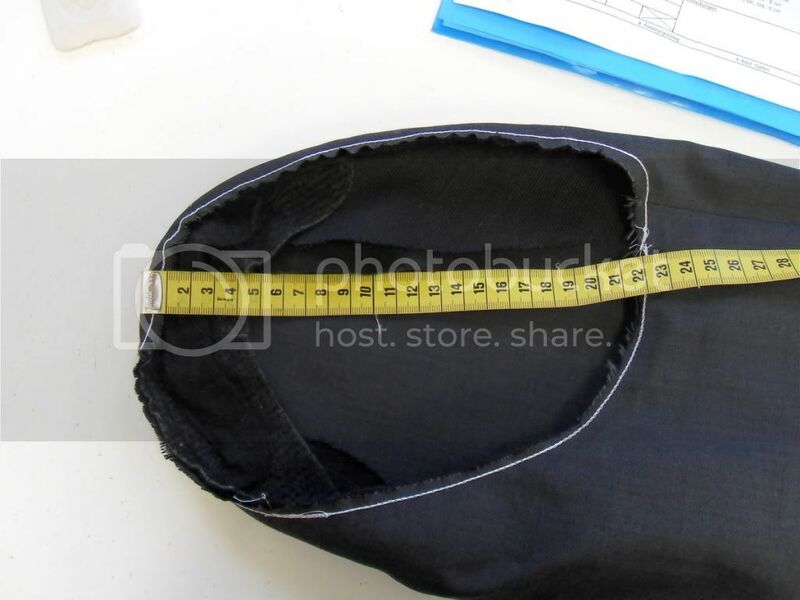 That's why short and wide men get a very deep armhole (this customer is about 160cm "tall"). It doesn't seem unusual to see armholes that big in the RTW jackets that come my way. The armholes look more like bad shirt armholes than jacket armholes. 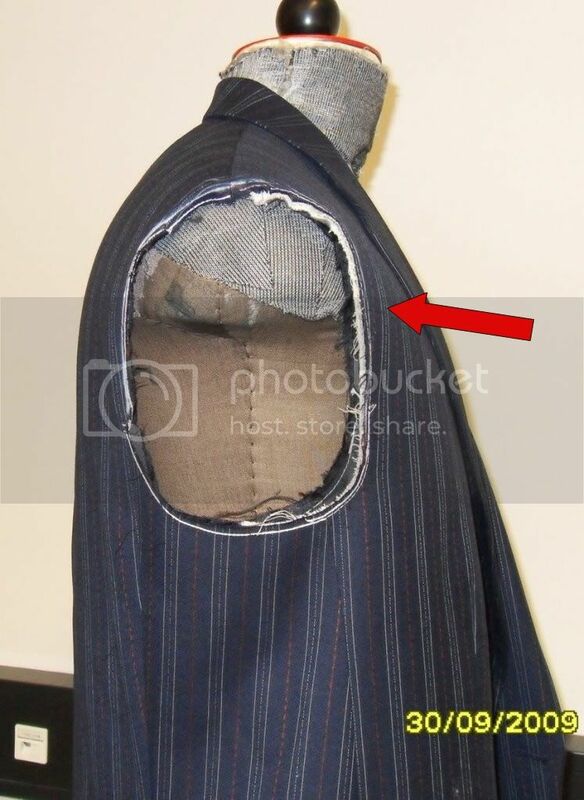 That's because the shape of the front armhole is so straight. All our coats from the RTW company have that straight front armhole, which is very deep and shallow. Why they cut the initial armhole for the basic sizes so low is beyond me, but that seems to be a common, worldwide problem. Although I must say that 1" (2,5cm) below the centre underarm is open to interpretations. The way I understand it it's 1" added to the direct measurement taken on the customer. There is only a mild solution for the problem, and that is to straighten the side panel. In order to do so you have to let out the side seam (above the waist) as much as possible, take away the same amount at the front and re-cut the armhole so it doesn't sit on the biceps no more. 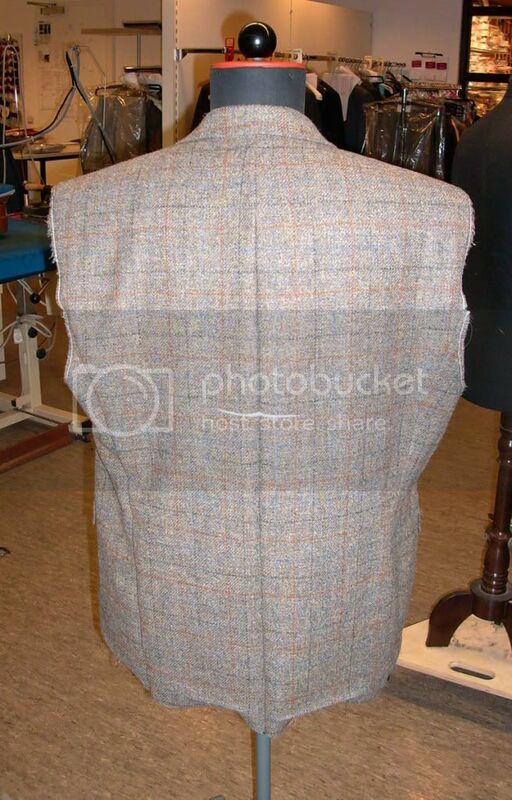 You'll still have a deep armhole, but by doing so the back of the coat is closer to the back of the customer and increases the range of movement a bit. It's one of the most common alterations we do and with good success! 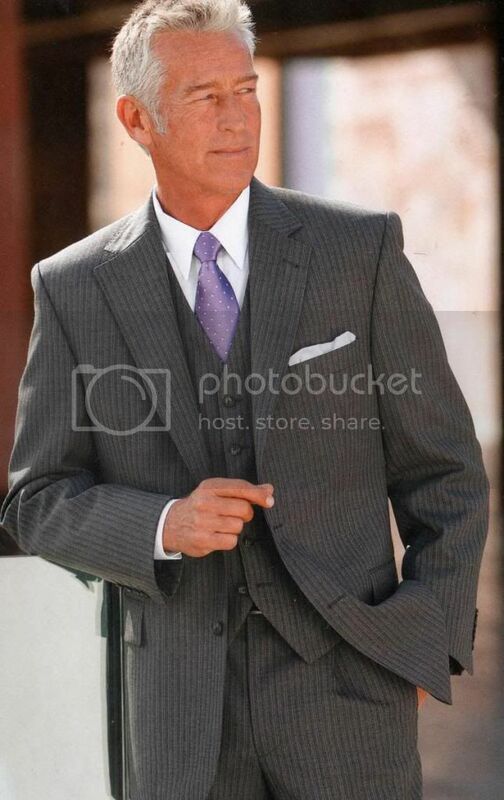 We have a size 50/52 sample suit in our Atelier, which is the basis for MTM. When I put it on I could easily get my hand between shirt- and coat armhole. And that's about 4" (10cm) deeper than necessary. It seems like the cad program would have a internal chart that would take the height and chest size and grab the correct armhole depth from the chart. Maybe the programers don't have a chart so they couldn't program the code to pull up the right armhole depth. It seems like I posted one that is in Poulins book. If you can talk to or write the cad programers and explain the problem and send them a chart they might spend a few hours adding to their cad program. This one company that I worked for I ask the accountant to buy a few things for the job because he handled the money, whereas, the owners were fumbled brained if you asked them. RE:CAD vendors. No. They won't. They aren't in the business of making patterns or patternmakers. They just make patternmaking software. If I want to use CAD to make an MTM style, I have to supply a proven block (i.e. digitize it in or draft it) and then program the areas of parametric change (e.g. torso length, etc). If the initial pattern is garbage to begin with, I'll get garbage when I print it in the MTM size. The MTM software is (I'm over-simplifying a bit) another way of grading a style based on personalized measurements. RE: coat block. It's an unfortunate base pattern from which all other problems emulate. That "open O" of a scye is just wrong. There's nothing more to be said. Until they fix that, the garments will always fit poorly. I like the Japanese example. All the hallmarks of good construction/execution appear to have been used. Edited by jcsprowls, 28 June 2010 - 01:19 AM. My impression is that our cut is so very 90's. Not that I want the recent, bad catwalk examples, but the maker of our MTM runs his own line of MTM, which usually much neater and has a more modern cut. In the past, there was a huge difference in the quality between coats we got from him. We had some major make problems with that one (lining way too tight, collar too wide and other things), but as soon as we got one of "their" coats it was just nice. I have a question: What if the scye on the sleeve is too wide? The upper sleeve matches with my marks in the scye of the body piece, but the scye of the under sleeve is too wide. 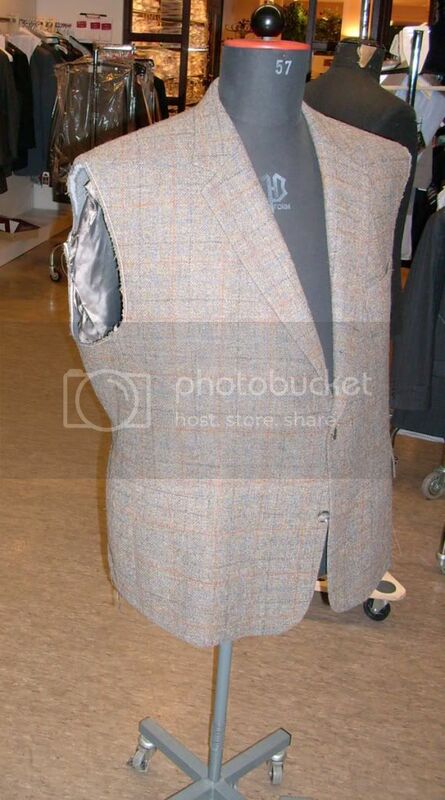 Scye is only the armhole of the coat body. The undersleeve being to wide because of the cloth pattern? Not sure that matters. The concern is more about fit. 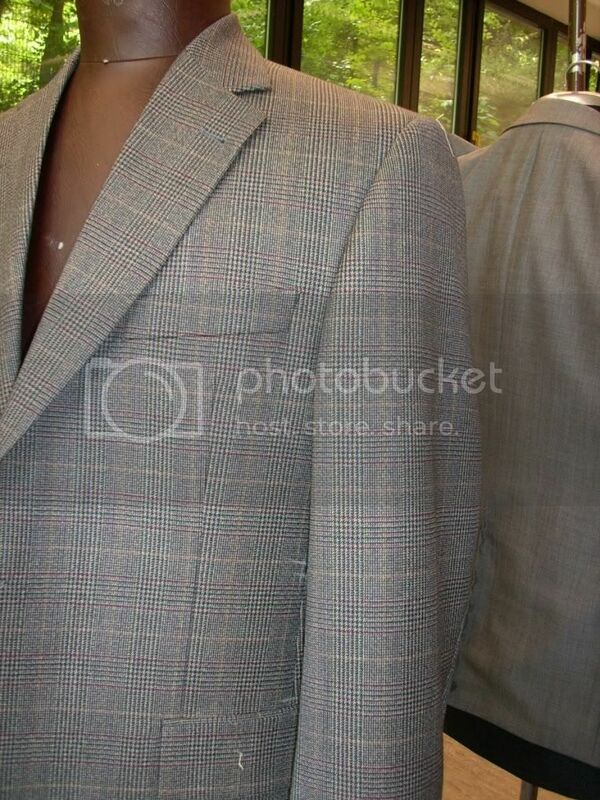 Where or how you lay the pattern on the cloth may matter for cloth pattern matching. After that, you will need to adjust the shape of the under sleeve, too. I'm sure your question will be answered. What makes you think the under sleeve is too wide? And how much "too wide" is it?